The key to successful therapy is finding the right therapist for you. 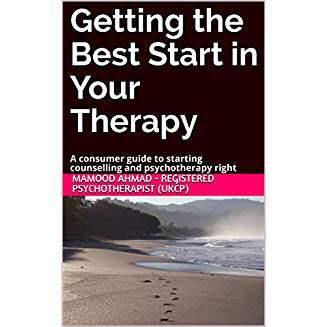 However good a therapist is, it is the relationship that determines whether you trust them enough, and they come to understand you enough, to help you explore and find solutions for your problem. For some issues you could see improvement within a few session while more complex matters may take longer to resolve. At the onset we can identify the method and work required so you can judge how long you need. We will review progress regularly, but it’s up to you. There are some specific issues, such as performance improvement, simple phobias and habits, that could be completed based on a 3-session plan. This is something we can discuss during our first session. It is a good idea to arrive a few minutes early, to make sure your appointment can start on time. If you arriving by car you can park ( for free ) right outside the Egremont building at the back entrance and press the buzzer labelled “PathTherapy” which will ring through to the therapy rooms. You will be greeted by a receptionist or myself and shown straight to the therapy room where the session can begin. Your first appointment will be include a consultation. It is a two way process. It will be an opportunity for us to get to know you, your concerns and hopes about therapy. You can find out about what counselling, psychotherapy and couples relationship counselling has to offer. You can ask questions, if you want to, about the therapeutic service and process. Yes, they can wait in the reception area. However, we would recommend you do this only if you deem necessary. Clients sometimes find this distracting, which invades the safe environment, but it’s up to you. Sessions run day, evening and weekends. You can contact me for availability. Can you provide me references/testimonials? We dont publish testimonials because they are considered unethical by many therapy related bodies (For example, the UK Council for Psychotherapy) particularly as they could be fabricated and the Advertising Standards Authority require them to be verifiable which conflicts with the confidentiality of clients. We recognise many directories and social media sites do allow for reviews, and I would recommend caution before publishing personal information. We recognise that clients will want reassurance about our experience and qualifications which are described here. Prior to any commitment, the initial consultation is free to determine whether it would be beneficial for us to work together. We are located in Binfield between Bracknell and Wokingham. Our location details are shown here. Do you offer Skype or home based therapy? Yes, this is possible dependending on the issue(s) you wish to explore and the therapeutic approach we adopt, but I recommend we discuss this prior. How long does each counselling sessions last? Each session will last 50 minutes but a maximum of one hour. Does the NHS offer Hypnotherapy? Not as standard. However, the NHS recommends you choose a “qualified hypnotherapist with a solid healthcare background, belonging to to a professional organisation such as the UK Council for Psychotherapy (UKCP)”. I have some further questions? You can contact us via form message, email or phone. Whichever you prefer. Do you a have a child, family member or partner that attends counseling? How do I know if someone is trained? The main registering bodies are UKCP and BACP. We are UKCP/or BACP Accredited, Chartered, Registered Psychotherapist and have worked in Youth counseling organisations. I am worried that my I am concerned that my child is saying things about the family? It is important that your child feels free to talk about experiences in the family that may be troubling or confusing. It matters that you give approval to your child to talk to the counsellor. It is understandable you might feel worried about what your child may wish to talk about in counselling. However, you should bear in mind that the strict code of ethics counsellors follow includes clauses about confidentiality. The counsellor is not there to judge you or anyone else in your family, their sole purpose is to help your child manage their problems and try to resolve them in a positive way. Can I ask my child about therapy sessions? The counselling relationship is very private and personal, and each child will respond differently. Some children may wish to talk to their parents about sessions, while others, especially teenagers, may wish to keep the content of the sessions to themselves. It is important to be guided by your child and to respect these individual differences. There may be times when your child seems more upset following a counselling session, and this may be because they have been talking about painful feelings. Showing sensitivity to their distress, while also respecting their right to privacy, is a difficult but important balance for parents to achieve. Can I ask my child’s counsellor how sessions are going? It is natural that you will want to know how your child is getting on in their counselling. It is important to remember the counsellor will have agreed to a confidential relationship with your child and has a duty to stick to this. The only very rare exception to this would be if the counsellor thought your child was at serious risk of harming themselves or others.